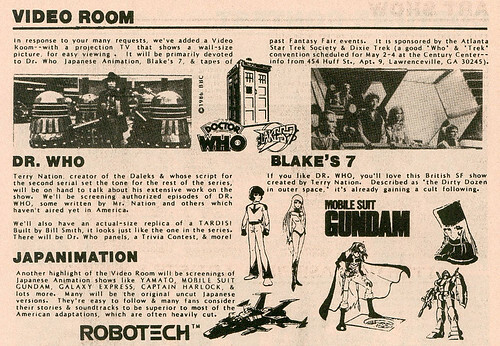 In the days before "anime cons", we had to express our enthusiasms for Japanese cartoons in different venues. This meant hurling ourselves at the gates of the local comic book, Star Trek, Dr. Who, gaming, fantasy, and sci-fi conventions. But could the world of anime succeed in a head-to-head battle with Mr. Spock and/or Darth Vader? Yes it could and it did, and we have the con publications to prove it. I know nothing about the Kansas convention advertised here, other than that it featured fanart of Grandizer and therefore caught my eye. 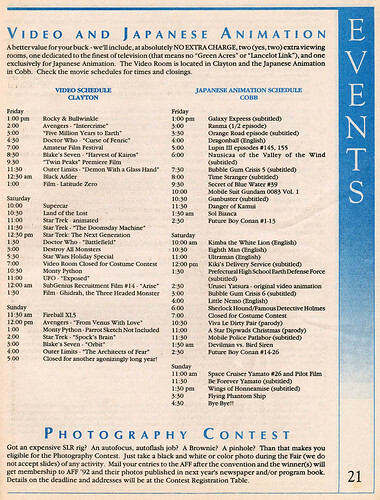 But soon, the spectre of Japanimation found its way to my home town in the form of the Atlanta Fantasy Fair. 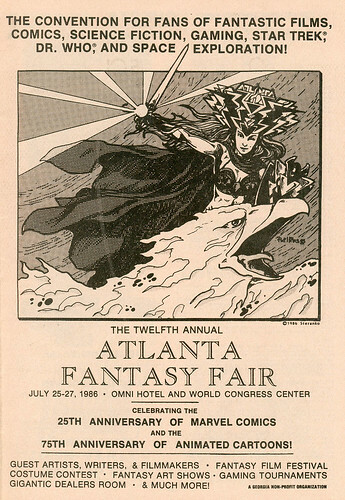 At the time Atlanta's largest fandom convention, the AFF started in 1975 and by the mid 1980s had realized these big-eye cartoons from Japan could very well be an attractive inducement to potential Fantasy Fairers. Not to be outdone, other Atlanta SF cons also jumped onto the Japanimation bandwagon with both Starfleet-booted feet. 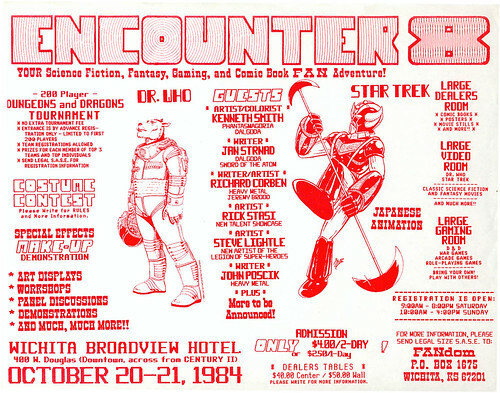 You'd think a convention called Dixie-Trek would be strictly Trekariffic, but they embraced the philosophy of "IDIC" and expanded their worldview to include Dr. Who, Blake's 7, comic artists, and eternal con guest Brad Strickland. And Japanese animation. 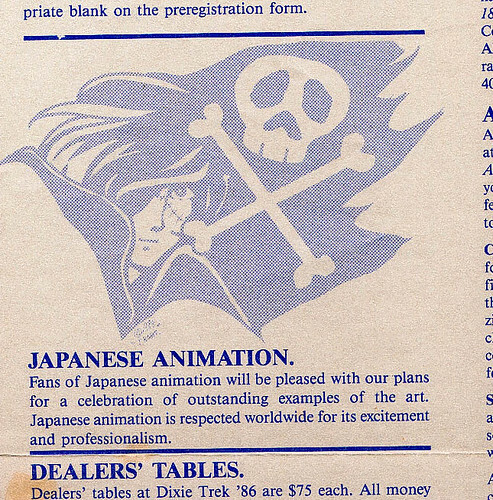 By 1988 the anime fan community in Atlanta was secure enough in its masculinity to break down the walls of tradition, smash the prejudicial, provincial attitudes of the bourgeouis, and run the darn anime rooms themselves. 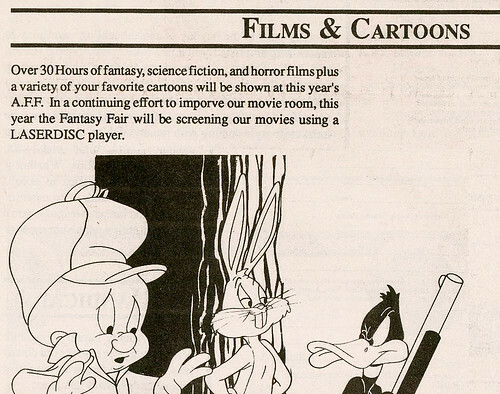 And when the convention wouldn't give us a room to show anime, we would just rent a guest room and bring a few VCRs and throw a TV Party. By the early 1990s the march of technology was unstoppable and new video formats were making the old fashioned VHS tape a thing of the past. 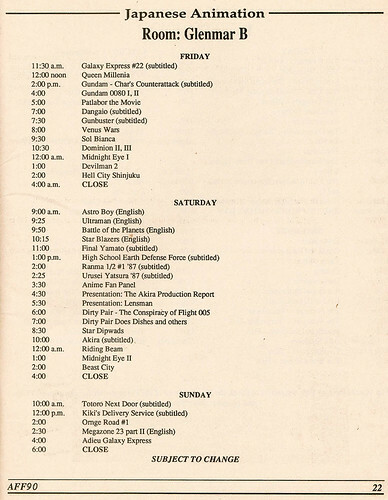 I was on staff by this time and had chiselled my way into running the anime room, the schedule of which is an informative document showing exactly what people wanted to see in 1990. Or at least what *I* thought people wanted to see. And no, I am not responsible for the typos, as amusing as it might be to contemplate watching something called "Riding Beam". 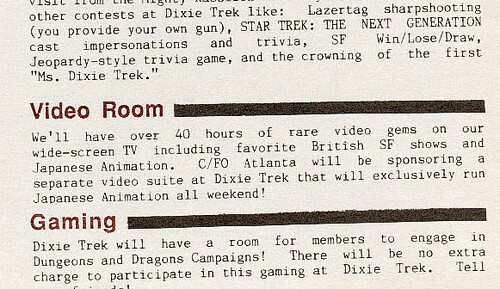 By 1991 I was running both video rooms, as evidenced by the trend towards Godzilla films, Twin Peaks, SubGenius propaganda, and my very favorite Star Trek episode. Here's a tip for time-travelling anime room programmers - as much as you like Future Boy Conan, nobody wants to watch 13 un-subtitled episodes of it in a row starting at 2:30am. Take my word for it. By a strange coincidence the last year for the AFF was also the first year for AWA and our energies became focused on our own convention world, leaving the comic book and Star Trek conventions to wither away, deprived of the life-giving force of Japanese cartoons. Don't let your convention die - show some anime already! Preferably RIDING BEAM or ORNGE ROAD.